Sighting down her long snout, and using her stubby legs, and tail half the length of her body, she propelled herself through the thick vegetation. Nothing bothered her armor-like skin as she worked her way over huge logs sunk in the muck. She was trying to get to the water, where she could float, immersed, waiting for something tasty to swim along. At the same spot, 225 million years later, Duwan pulls the battery out of our cell phone. Again. The phone has been cutting off and refusing to reboot. Sometimes removing and replacing the battery helps. The same spot? You could argue against that. First, the continents have shifted in that time. We are now much farther from the equator. Also, the land has been pushed to a higher altitude, over a mile above sea level. And, of course, the Earth itself travels over 11 trillion miles per year through space. So not exactly the same spot. 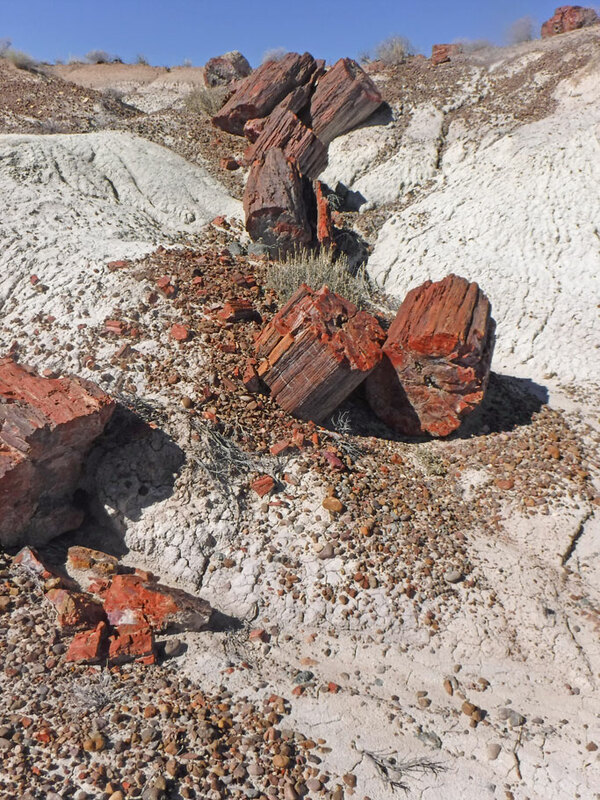 But the land underfoot does have fossilized remains of the crocodile-like phytosaur, and lots of those trees. 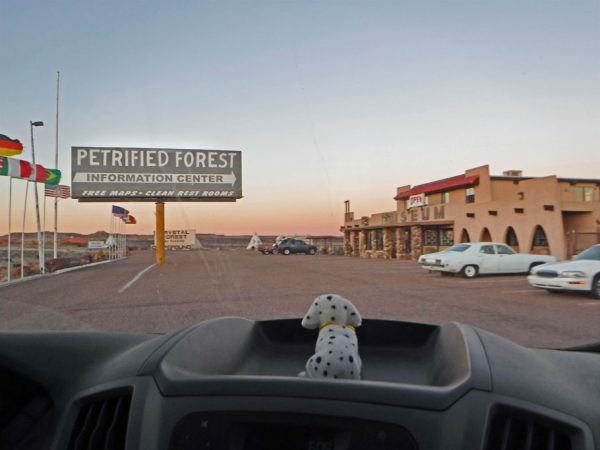 We’re in the Petrified Forest!!! I kind of wish it had been named the Petrified Log Preserve. The word “forest” allows potential visitors to envision standing trees, with nests of bird skeletons in them, and possibly even reconstructed pterodactyls hanging from them. 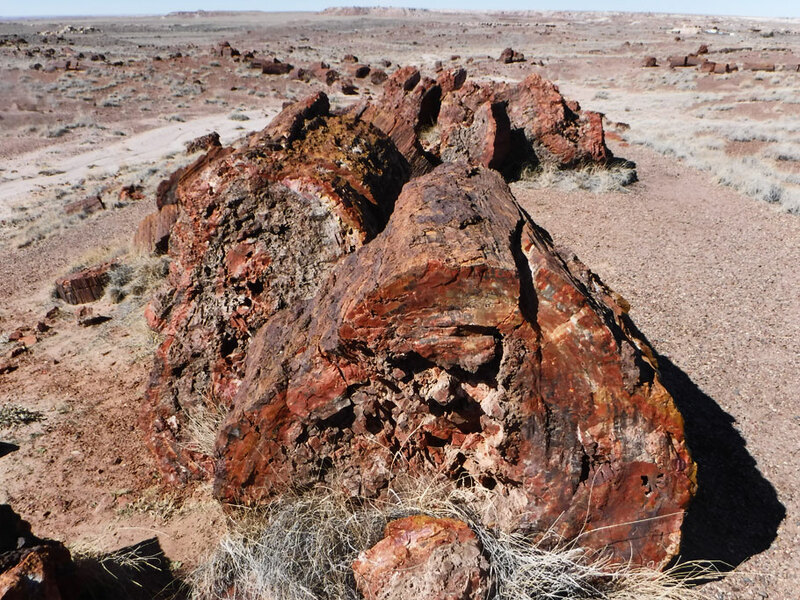 Instead, it just looks like rocks in the desert. Not everyone (Duwan) puts three exclamation points after the location name. But Duwan is a good sport, and doesn’t mind humoring me. You see, I think fossils are special. You have to be pretty fortunate to become one. First, you have to have hard body parts. So jellyfish, octopi, and squids don’t make the cut. And you have to die and get buried in just the right conditions. And then, odds are you’ll never be found. So someone like me, who thinks that it’s highly improbable in our universe that a chunk of matter gets to be alive in the first place, really appreciates the rarity of fossilized remains. I’ll probably never achieve fossilhood myself. Possibly sensing my feelings of regret over this, Duwan wondered aloud if a person could cause wood to turn to stone. Turns out you can. In 1986, Hamilton Hicks was issued a patent for his wood petrifying process. Other folks have verified that his method of saturating wood in a chemical solution and drying it quickly can work in the right conditions. I don’t think it works for humans, though. Back at the gift store parking lot, where we are staying for the night, Duwan tries rebooting the phone again. But our link to the world is now completely dead. How will we find free campsites? We need to find some wi-fi, research phones, figure out where to have one sent, and buy one and have it delivered. 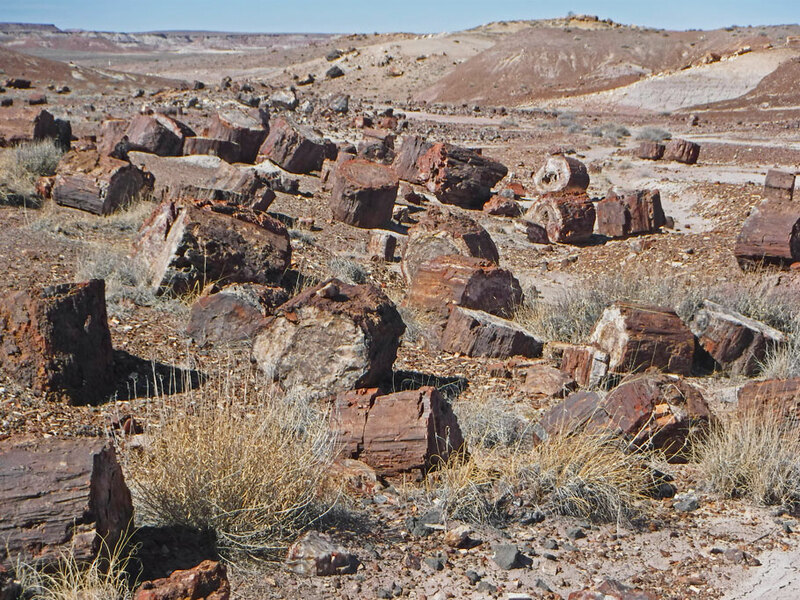 The two gift shops at the south end of the Petrified Forest allow camping in their parking lots. We spent a couple of nights here. 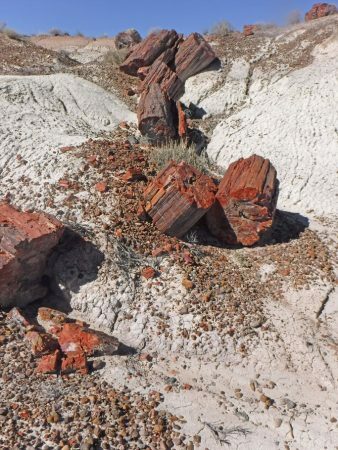 When the grounds are covered with petrified wood, use it as building blocks. 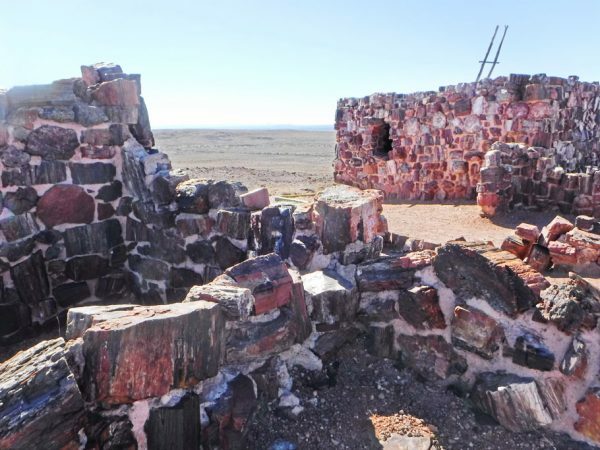 The Painted Desert Inn, which was renovated by the Civilian Conservation Corps (CCC). View of the Painted Desert from the back porch of the Painted Desert Inn. Cross section of a petrified stump. Different minerals in the quartz crystal give it different pigments. The buried trees turned to stone over time. Now they are uncovered in ground that has shifted around. Most have broken up into large chunks. Large chunks of petrified wood. No longer the lush environment it once was. View from overlook at Jasper Valley. There is no fixed trail here, but you can wander around below, climbing over the huge reddish tree sections that cover the ground. Long tree with hills in the background. 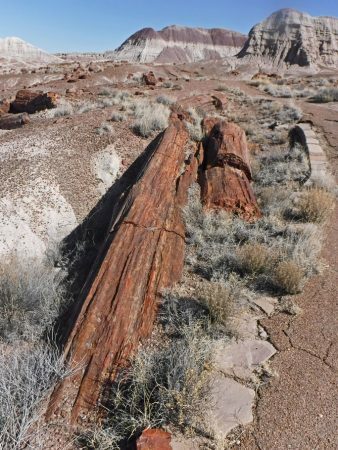 Fossilized remains of the phytosaur who made an appearance at the beginning of this post. Just one of the many interesting fossils at the museum here. 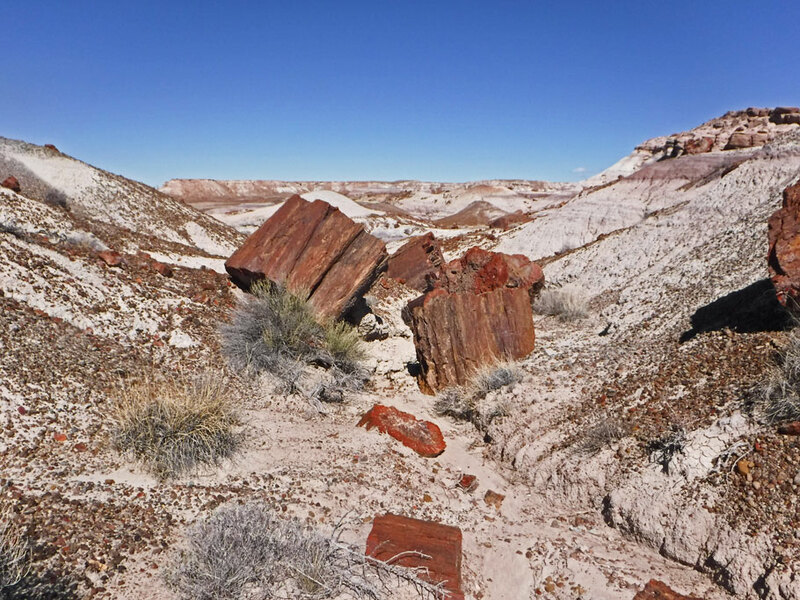 This entry was posted in Arizona, National Park Service, Travel On The Dirt and tagged Arizona, desert, Fossils, National Park, NPS, Petrified Forest. Bookmark the permalink. Great blog. 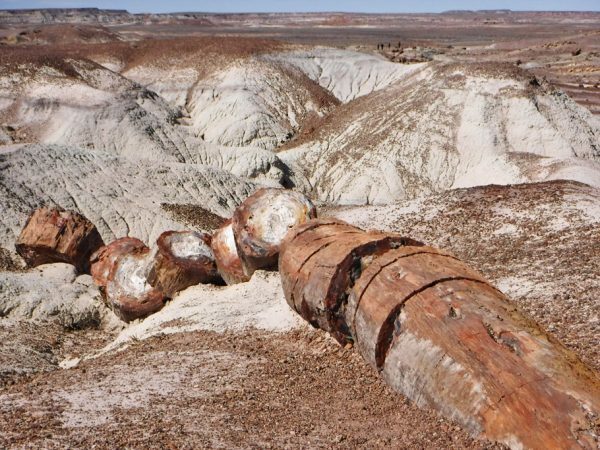 I completely agree that “petrified FOREST” implies verticality, that’s how I have always pictured it. I, too, wish that I could become a fossil, my wife says that I’m one now. I have heard that after cremation, one’s ashes could be pressed into a mineral form, I could go for that. There’s also a company that will take a portion of your ashes and send them to the moon, that would be cool too. Keep sending the great stories, I miss your unique perspective on weird things! Thanks. Ooh, what if you could have your ashes glued into a personalized mold of your college’s team symbol before having them sent to the moon? 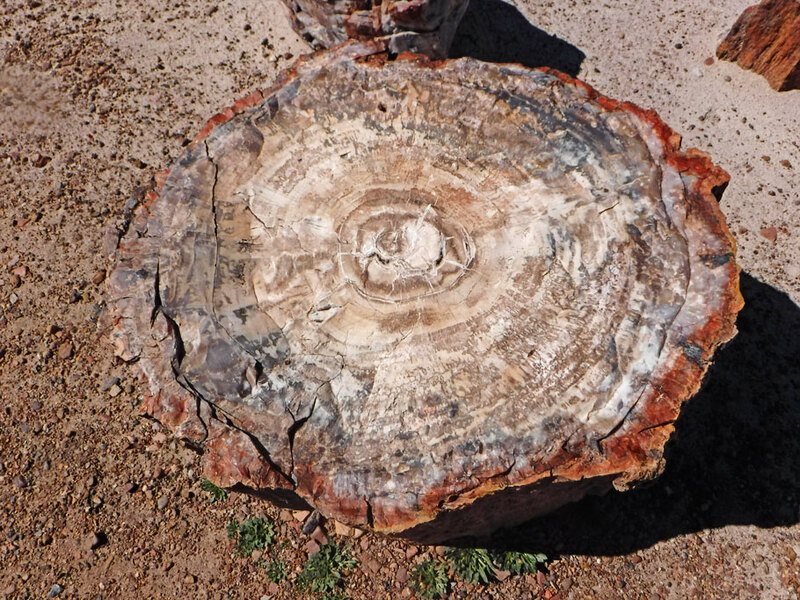 Oh, go on – try that wood-stone transformation process out on humans. I have a few suggestions for test subjects. That would be an interesting place to visit – the Petrified People Forest.